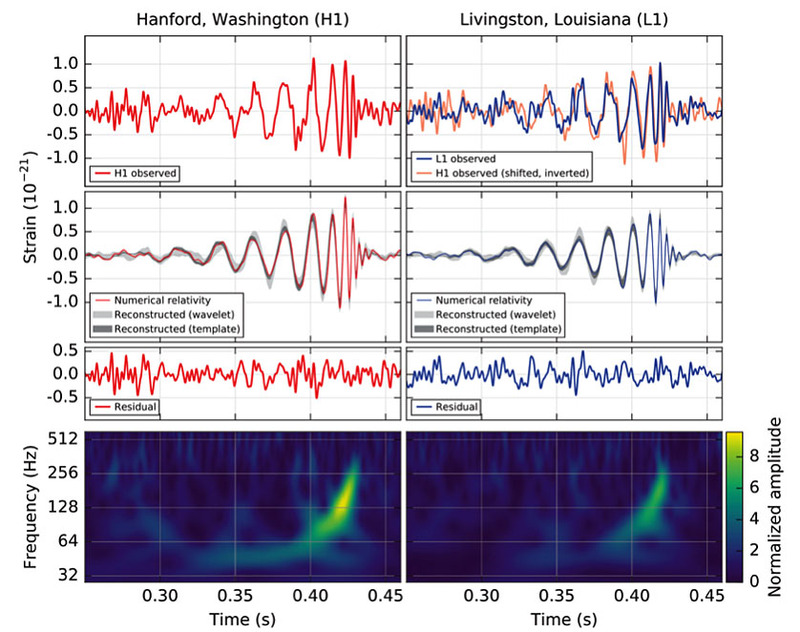 The era of gravitational-wave astrophysics has begun! We will give a brief overview of what LIGO is, what it is finding, and what this teaches us about the Universe. The LSST project is constructing an 8.4 meter telescope at Cerro Pachon, Chile, which will be used to conduct a 10 year imaging survey in six bands over 18,000 square degrees of sky. Four major science goals include: the study of dark matter and dark energy, detect hazardous asteroids and other objects in the solar system, monitor the transient optical sky, and address questions regarding the formation and structure of the Milky Way. 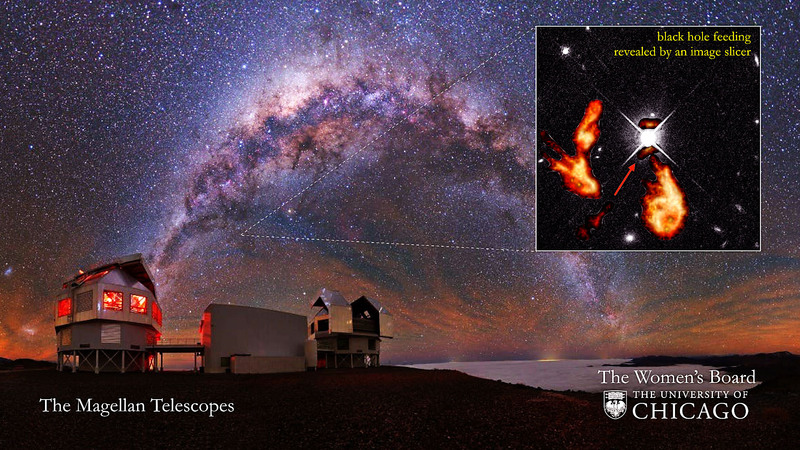 This talk will address how these science goals will be achieved, focusing particularly on dark energy. It will also examine some of the technical requirements driving the design, solutions that have been developed, and the impact of certain features of the hardware on the ability to extract science. Thanks to giant extensive air-showers observatories, such as the Pierre Auger Observatory and the Telescope Array (TA), we now know that the sources of ultrahigh energy cosmic rays (UHECRs) are extragalactic. We also know that either they interact with the CMB as predicted or sources run out of energy at the same primary energy scale that triggers pion production on the CMB! Their composition is either surprising (dominated by heavier nuclei at the highest energies) or the hadronic interactions at 100 TeV are not a standard extrapolation of LHC interaction energies. Hints of anisotropies begin to appear as energies above ~60 EeV, just when statistics become very limited. Basic questions remain unanswered: What cosmic objects generates such extremely energetic particles that reach above 10^20 eV (100 EeV)? What is this extreme acceleration mechanism(s)? What is the composition of these particles? How do they interact on their way to Earth and with the Earth's atmosphere? To resolve this mystery, we need to increase the statistics of UHECRs observations above 60 EeV. In addition neutrino and gamma-ray observations at ultra-high energies will be ground-breaking. An international collaboration built the Extreme Universe Space Observatory (EUSO) on a super pressure balloon (SPB) to be the first to detect UHECR fluorescence from above. EUSO-SPB will fly this Spring and inform future space missions designed to unveil the extreme energy cosmic frontier. 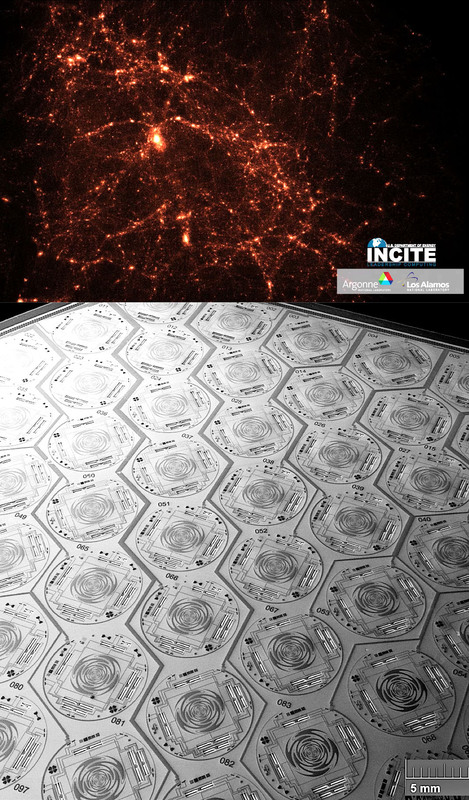 In this FRS, we will give an overview to cosmological research at Argonne National Lab. At Argonne, we study the growth of large scale structure (LSS), the Cosmic Microwave Background, and research at the intersection of the two. 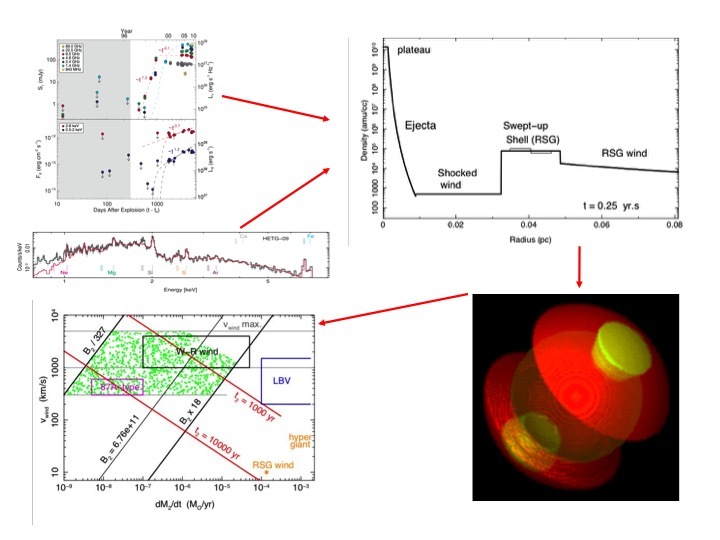 For (LSS) we make extensive use of computing resources at the lab to perform computationally intensive simulations (large scale cosmological N-body and hydrodynamical simulations) and are actively involved in a number of optical-IR surveys including DES, DESI and LSST. 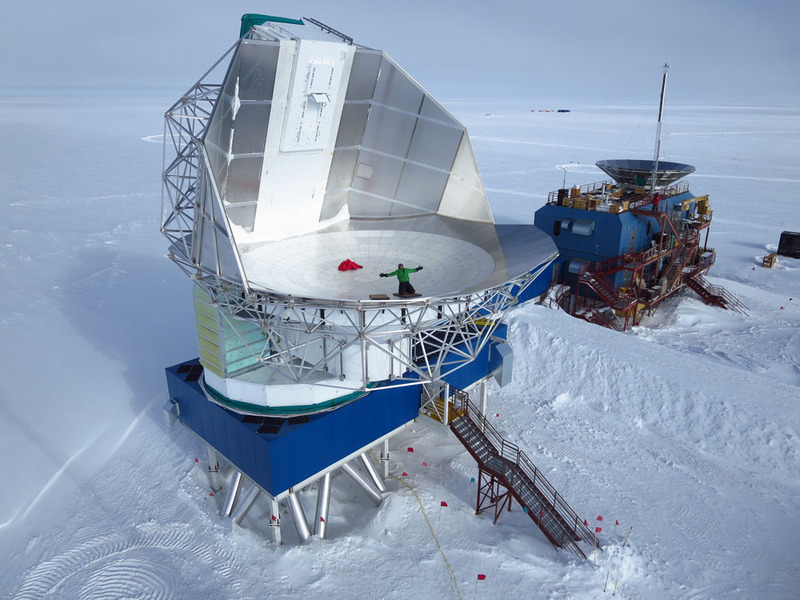 Our CMB research centers around science with the South Pole Telescope where we are major partners in instrumentation, including fabricating and testing detectors using nanofacilities and cryogenic testbeds at the lab. Argonne is also naturally exploring science at the intersection of LSS and CMB including studies of galaxy clusters and gravitational lensing. The virial equations and the virial theorem are well known tools of inquiry in dynamical astronomy. However, astronomers seldom appreciate the full power of the tensor virial equations in theoretical investigations of the dynamics of stars and stellar systems. After a brief review of the history of the virial equations and of conventional astronomical applications, we devote most of the seminar to an investigation of the dynamical behavior of a low-dimensional model of a merger of two galaxies. The governing equations of the model are the complete sets of moment equations of the first and second orders derived from the collisionless Boltzmann equations of the galaxies. 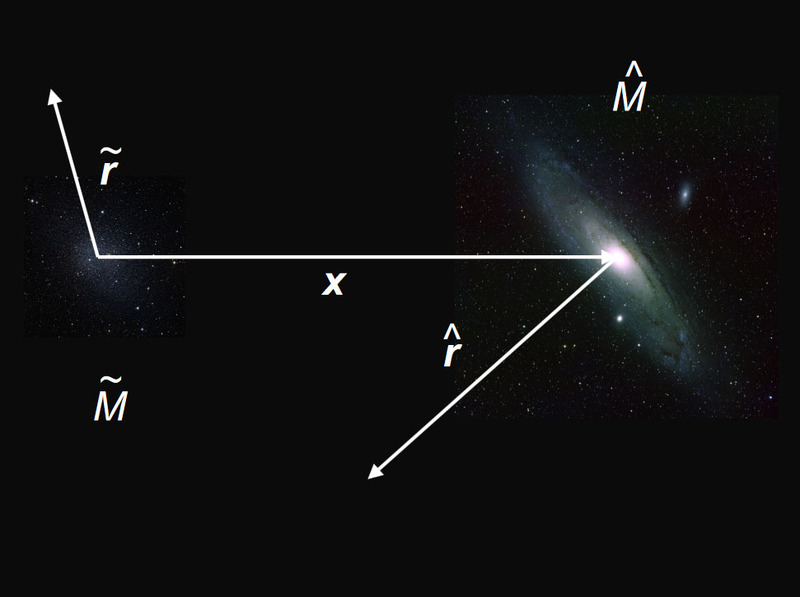 The moment equations of the first order reduce to an equation governing the relative motion of the galaxies. The moment equations of the second order separate into the tensor virial equations of the galaxies and sets of equations governing the evolution of the kinetic energy tensors of the galaxies. In order to close the systems of moment equations, we represent the galaxies as heterogeneous spheroids with arbitrary stratifications of their density distributions, and we represent the mean motions of the stars in terms of velocity fields that sustain the adopted density distributions consistently with the equation of continuity. We reduce and approximate the governing equations in the case of a head-on encounter of a dwarf galaxy with a giant galaxy. That reduction includes the effect of dynamical friction on the relative motion of the galaxies as in earlier investigations by Tremaine and others. 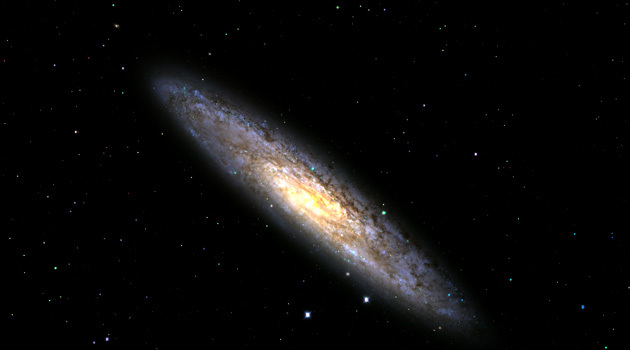 In a survey of mergers involving dwarf galaxies of different masses and sizes, relative to the giant, chaotic behavior of the system arises mainly in non-linear oscillations of the dwarf galaxy. An encounter either disrupts the dwarf, excites chaotic oscillations of the dwarf, or excites regular oscillations. Dynamical friction can drive a merger to completion within a Hubble time only if the dwarf is sufficiently massive. I will describe the final results of a search for entangled exotic shear fluctuations which are postulated to exist in order to preserve holographic information bounds in a macroscopic system. 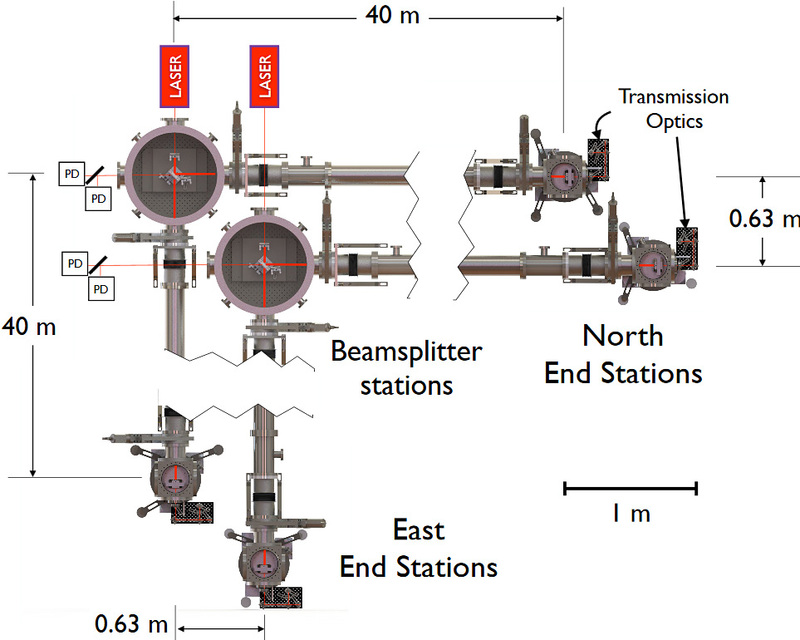 The instrument, constructed for this purpose, consists of a pair of collocated, 40 m long, high-power Michelson interferometers operating at fundamental noise limited differential arm length sensitivity. The cross-correlated signal from the interferometers in a band from 1 to 10 MHz is used to exclude shear-noise strain power spectral density to less than 0.2 the Planck time, well below the level needed to preserve the holographic bound. The instrument is now modified to search for angular fluctuations and we expect to start taking data this month. 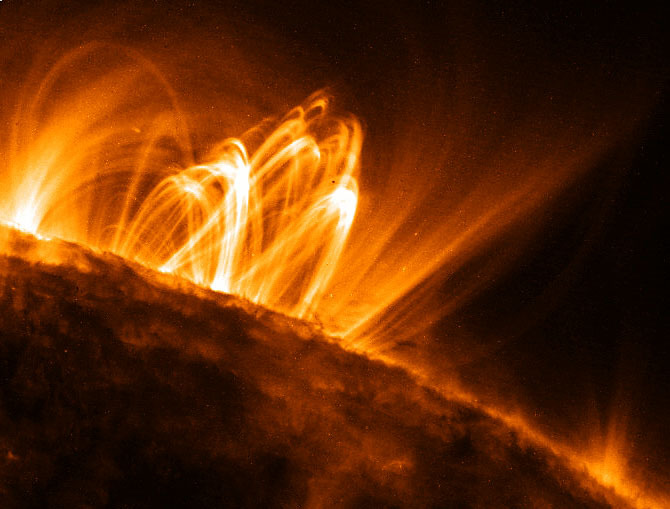 This is an image taken in soft x-rays of the Sun, using the TRACE telescope, a normal-incidence x-ray imaging telescope, showing a complex of multi-million degree coronal plasma loops at the solar limb. Picture: This is an image taken in soft x-rays of the Sun, using the TRACE telescope, a normal-incidence x-ray imaging telescope, showing a complex of multi-million degree coronal plasma loops at the solar limb. Humans first arrived at the South Pole over 100 years ago during the "Heroic Age" of Antarctic exploration. For the past 30 years, a new-generation of explorers have been traveling to the South Pole to build telescopes to study the origin of the Universe. These experiments measure light left over from the Big Bang, which we call the cosmic microwave background (CMB). The CMB provides a unique snapshot of the infant Universe at a time when it was only ~400,000 years old, or 0.003% of its current age. These measurements, and other evidence, tell us that the Universe began with a Big Bang about 14 billion years ago, and that it contains only 4 percent "ordinary" matter (e.g., stars and galaxies, you and me, etc.). The rest of the Universe consists of two mysterious dark components: Dark Matter and Dark Energy. We will discuss evidence for the Big Bang, Dark Matter, and Dark Energy; the latest results from the South Pole, the new SPT-3G experiment installed in January 2017, and what its like to work at the bottom of the world. Besides discovering thousands of planetary systems orbiting other stars, one of the legacies of NASA's Kepler mission is the discovery of new planetary architectures. Systems of up to seven planets have been found with orbital periods near integer ratios, librating in three-body resonances. These features point to disk migration into their current orbits and a history of tidal dissipation in the planets over the lifetime of the star. 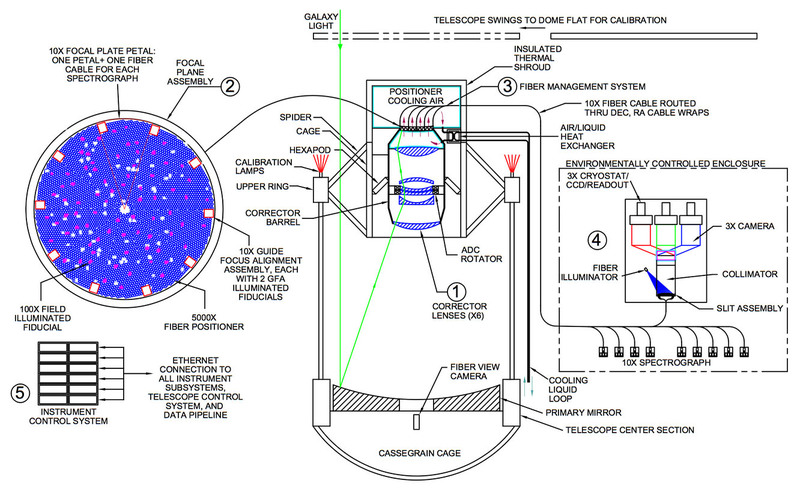 The Dark Energy Spectroscopic Instrument (DESI) is a large-scale spectroscopic survey of galaxies and quasars in the northern hemisphere, aimed primarily at measuring the BAO signal and redshift-space distortions to high precision at large redshift. The optics, fiber system, and spectrographs are being fabricated now, with the goal of on-sky commissioning by summer 2019. I will describe some aspects of the project, including the new imaging survey being undertaken to provide targets for DESI spectroscopy. How does stellar mass loss behave towards the end stages of a massive star's life? What determines the structure of the medium around a massive star, into which the resulting supernova shock wave expands? What factors affect the dynamics, kinematics and emission signatures of the resulting supernova? What stars give rise to the various types of supernovae? Are supernova explosions spherically symmetric? In this seminar we will see how the X-ray emission from the supernova shock wave can allow us to probe the answers to these and related questions, which have traditionally been the domain of optical astronomers. We will follow the evolution of the shock wave as it behaves as a time machine to uncover the progenitor star's history! 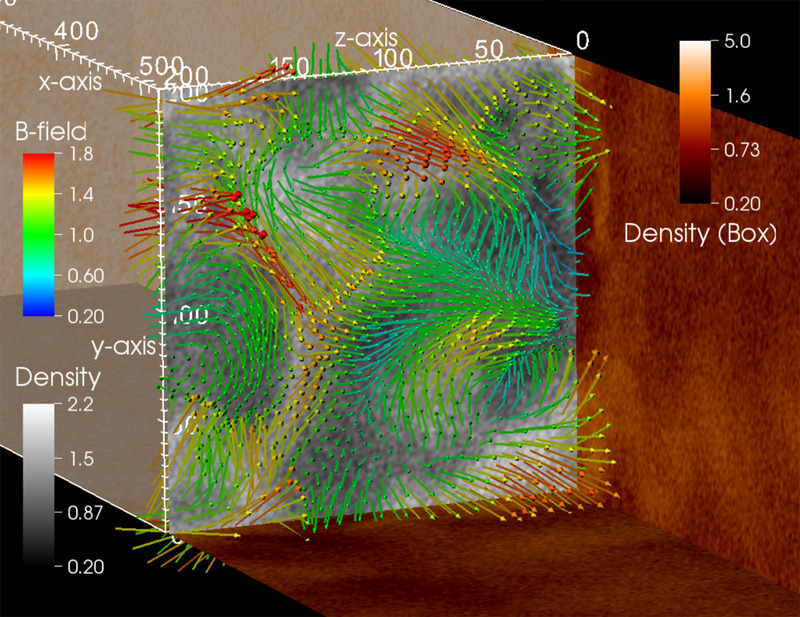 I will describe how we can use X-ray observations, coupled with numerical simulations and simulated X-ray spectra, to study the dying gasps of a massive star, understand the dynamics and kinematics of supernova shock waves, investigate the radiation signatures, and identify the progenitor.